Arrow-Amitriptyline (Amitriptyline Hydrochloride) works as a treatment for depression by affecting the neurotransmitters noradrenaline and serotonin in the central nervous system. This can help to restore the normal mental balance and potentiate the action of the neurotransmitters that can boost the mood and relieve feelings of depression. Arrow-Amitriptyline (Amitriptyline Hydrochloride) works as a treatment for depression by affecting the neurotransmitters noradrenaline and serotonin in the central nervous system. This can help to restore the normal mental balance and potentiate the action of the neurotransmitters that can boost the mood and relieve feelings of depression. A sedative effect may also be produced by this medicine, and this can make it suitable for the treatment of depression in people who are also suffering from agitation and anxious moods. Other uses include the prevention of migraine and neuralgia (nerve pain). 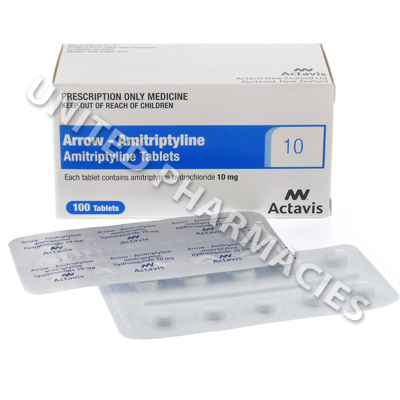 Arrow-Amitriptyline (Amitriptyline Hydrochloride) tablets should be administered as directed by your doctor. Adults affected by depression may be directed to take 25mg to 100mg per day, usually given as 2 to 4 separate doses. This may be adjusted for maintenance treatment. If used for migraine prophylaxis, it is possible that the doctor will instruct the patient to take 10mg per day, administered just before bed. Pain is treated with a different dosage regimen, and in all cases, it will be necessary to only take the dosage that your doctor has ordered you to take. You will need to go and see a doctor straight away if you suffer from seizures, hallucinations, muscle or shaking movements that you are unable to control, difficulty speaking or balancing properly, bruising or any other severe side effects that have not been listed here. Patients should note that a serious drug reaction may occur if this medicine is taken in combination with an MAO inhibitor (a type of medicine). Your doctor will advise you not to take this medicine if an MAO inhibitor has been administered within the previous 14 days. After you stop taking this medicine, it will be necessary to wait 14 days or more before another MAO inhibitor can be taken. Consumption of alcohol should be avoided during treatment with these tablets, as doing so could lead to serious or potentially dangerous reactions. In addition to this, your skin may become more sensitive to the sun. Stay away from tanning lamps and avoid all unnecessary exposure to the sun. Always use Arrow-Amitriptyline (Amitriptyline Hydrochloride) as you have been prescribed by your doctor. Never self-medicate or change your dosage without first consulting your doctor. The correct dosage can vary depending on your health, medical history, and the severity of the condition being treated.